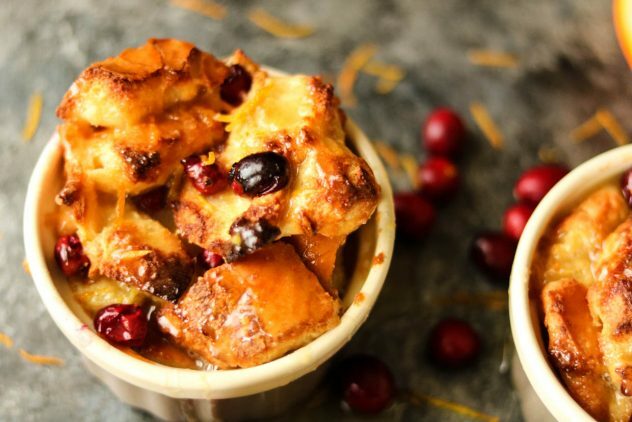 A perfect dessert for your upcoming autumn dinners, orange cranberry bread pudding! 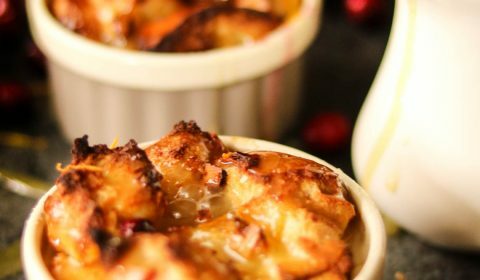 Bread pudding is one of my favorite desserts! I mean, who can’t get behind a dessert that also includes bread?? 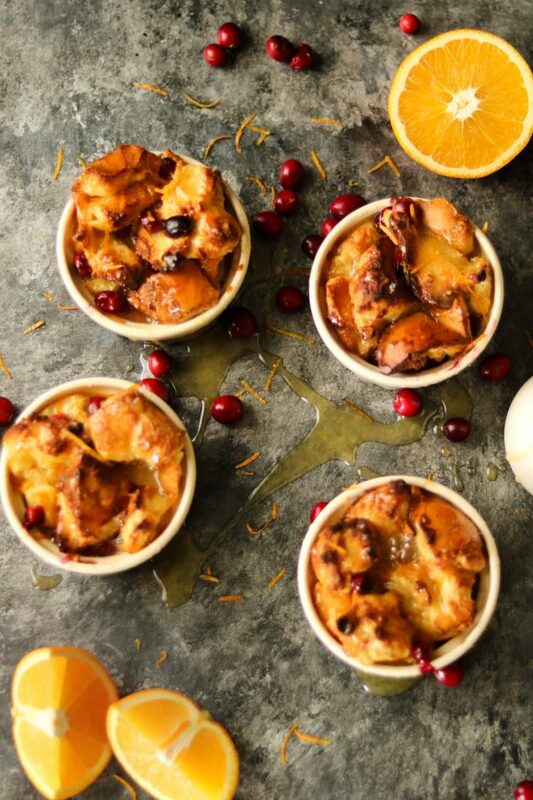 This orange cranberry bread pudding includes a to-die-for orange cream sauce, but we’ll dive into that later. I do love a good traditional bread pudding, but sometimes they can get too soggy and sometimes I’m just not feeling raisins, ya feel me? I wanted to create a non-traditional dessert around Thanksgiving and I think I found a winner! 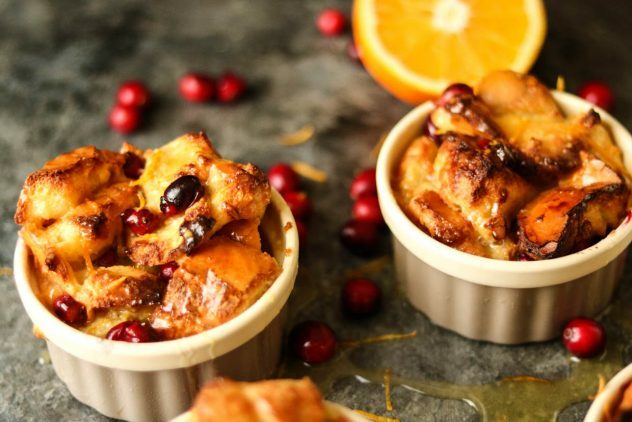 This orange cranberry bread pudding uses French bread and by cooking them in individual containers it allowed for a nice crisp on top with some moisture in the bottom. My husband always said he hated bread pudding because he didn’t like the soggy bread texture so he was a little hesitant to give this a shot. I’m happy to report he LOVED it and said the moisture was just right! Score another win for me in the kitchen! The fresh cranberries add just a hint of tart, combined with the orange cream sauce and it’s a match made in heaven. Let’s talk about this orange dream….I mean cream sauce. This homemade sauce has just the right amount of fresh orange flavor, combined with the orange zest, to really bring out the flavor but not be overpowering. I could have put this orange sauce on just about anything. If you love orange sweet rolls, this will be right up your ally! 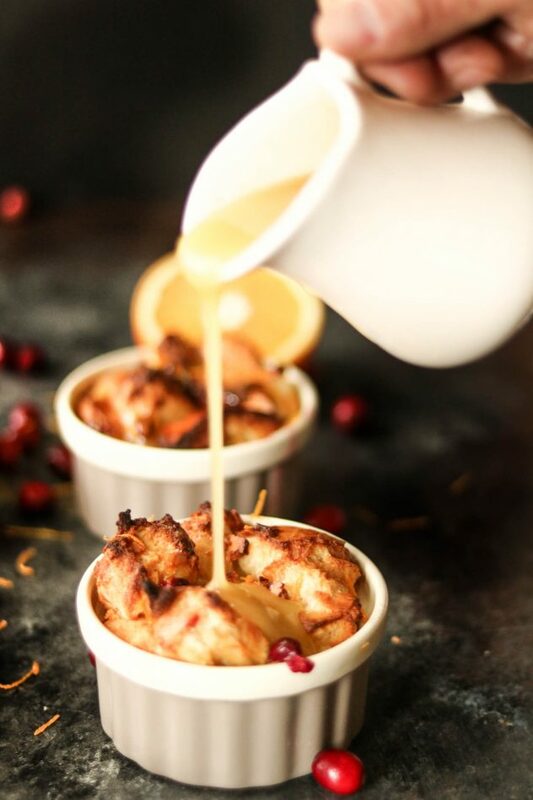 This orange cranberry bread pudding is a great non-traditional Thanksgiving dessert, or enjoy anytime of the year! Cut about 3/4 of the French bread loaf into large cubes and add to a large mixing bowl. In another mixing bowl, combine the milk, eggs, vanilla, orange juice, melted butter and sugar and whisk to combine. Pour mixture over the bread cubes. Stir until the bread is covered, then place the bowl into the refrigerator for 30 minutes. Remove bowl from refrigerator. Adding fresh cranberries and stir once again. Place the six individual ramekin dishes onto a baking sheet. Grease with butter or a non-stick spray (I used coconut oil spray). Using a slotted spoon, spoon the bread mixture into the individual dishes. You’ll want a nice pile of cubes in the dishes (see the pictures). This will allow you to have a crisp top. If there is any remaining liquid in the bowl after removing all the bread, pour over the individual bowls. Bake for 50-60 minutes. While the bread pudding is baking, make the orange cream sauce. In a small saucepan, melt the butter on low heat. Add in the sugar, egg, and orange juice and whisk to combine. Add in the orange zest. Slowly cook over low heat, stirring constantly, until the mixture thickens, then remove from heat. Do not allow the sauce to simmer! Once the bread pudding has finished baking, remove from oven, and let cool for 5 minutes. Top with orange cream sauce and serve warm. Oh my, I love the idea of the orange and cranberry flavors together, it sounds wonderful! That pour shoot makes it look so good. Oh my drooling. This sounds amazing and perfect for the upcoming fall season! it will be here before you know it!! I keep a package of cranberries in my freezer so that I always have some when I’m ready to make my fall recipes! This one looks and sounds like a keeper!!! Orange and cranberry has to be one of my all time favorite flavor combinations. It reminds me of fall, but I still enjoy it year round – gets me excited for the holidays! I love love loooooove bread pudding. This one is on my list for the next one to make! Yum!! You are right I could eat this any time of year but it will definitely be a hit this upcoming Holidays thank you!! What a fabulous combo for a fall dessert! I definitely want to try this one! As much as I don’t want to think about fall quite yet, this dessert totally has me in the mood! What a gorgeous combo 🙂 Great for when you stock up on bags of cranberries at the end of the season! I was just thinking about Fall today, I can see making this for after a Sunday Night Football dinner! The combination of orange and cranberry sounds excellent! I haven’t had bread pudding for a zillion years. And I’ve never had orange cranberry bread pudding. Your recipe looks absolutely fabulous! I can’t wait to try it! This is the perfect FALL dessert. Not that I want summer to end, but fall flavours are some of the most delicious ever. I will print this out and make it when the cool weather sets in.